Facebook Live Around the World is a relatively new interactive map created by the social networking service that displays live streams as they happen in the world. Everyone and their mum seem to be live streaming these days using apps like Periscope or services like Twitch. Facebook supports live streaming as well but unless you follow Facebook news closely or have a friend who started to live stream already, you may not have know about this until now. Facebook explains that you need the iOS or Android application to live stream, and that the feature is not yet available in all regions of the world. If you are not interested in streaming to an audience but are interested in live streams that are currently available, then you may find the Live Around the World map useful for that. The easiest way to check the Facebook Live Map out is to open this link in your browser of choice. Good news is that you don't need a Facebook account to access the map and tune in to live streams but you won't be able to use all functionality if you are not logged in to a Facebook account. This does not affect the live stream though and if you just want to check out streams and tune in, then you can do so without account as good as you can with account. You may also access Live Video by selecting the link under Apps when you are on the Facebook website. 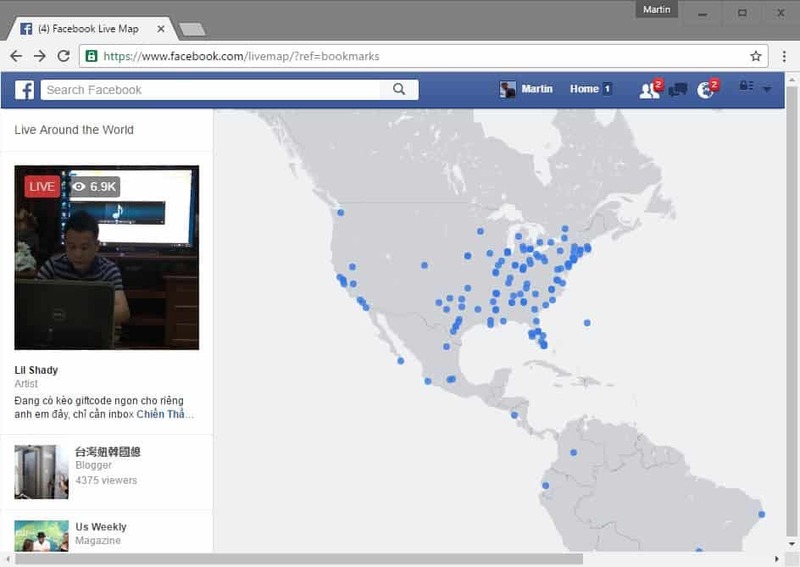 The Facebook Live Map displays dots around the world that indicate that a Facebook user is streaming live at that location. You don't know what is being streamed, and even if you tune in you may not understand a thing depending on the language used. To tune in to a stream hover the mouse cursor over it. Facebook displays the stream directly, but you can click on it to open a larger version of it featuring additional options such as a comment form or like buttons. There is no search which means that it is always a hit and miss if you start to explore live streams on your own by hovering over points on the map. 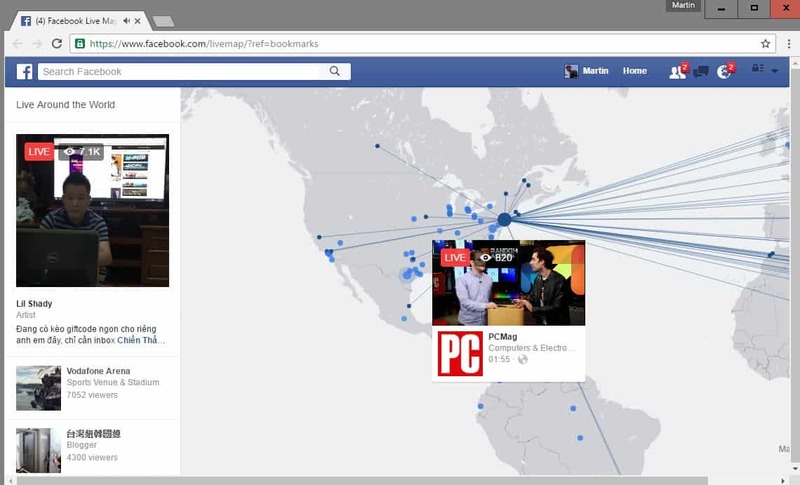 Facebook displays popular streams on the left on the Live Map website and those may be a good starting point. As far as content is concerned, you get live concerts, people signing in their car, news coverage, wrestling training sessions, live gaming commentary, streams with make-up tips, cooking streams, preachers, more people driving in their cars, and more people signing to music. The majority of streams are probably not that interesting to a wider audience, but that does not mean that you won't find any of them interesting. Facebook Live Map, or Facebook Live Around the World, is an interactive map that displays live streams from around the world that you can tune in. The page is now pulled from Facebook! Still working on my end. Is there any sort of country restrictions to it? awesome. cheers. working here in nz. even though the map is looping, you can’t drag across the map..
It’s a big brother. Orwellian net by Facebook. Very sadly.